Contestants run, bike and paddle their way around Colorado Bend State Park ... IN THE DARK. When a dirt-smeared Ellen Gass and Gena McKinley slide into the finish of the Howl at the Moon adventure race well after midnight, a cowbell clangs. Gass flops to the ground, lets out a groan, then pops up to hug her teammate. “We did it!” she hollers. Someone passes around a plastic pumpkin full of candy, and the smattering of people who are still awake celebrate. The pair spent more than six hours trail running, mountain biking and paddling their way through Colorado Bend State Park in Central Texas, punching a “passport” at designated checkpoints along the way. And if their experience was anything like mine, they also dodged a slow-moving armadillo or two, inhaled the earthy scent of a startled skunk and leaped over a snake that slithered across the trail in front of them. 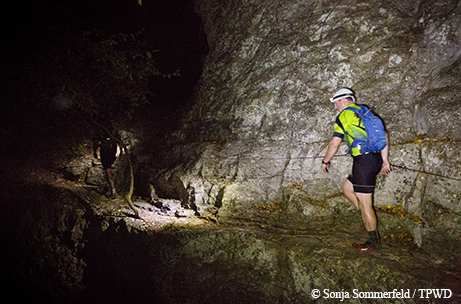 Welcome to the wonderful world of nighttime adventure racing, in which competitors plunge into a wilderness illuminated only by the flickering beam of a headlamp, not knowing exactly where they’re going or how they’ll get there. It’s bliss, at its knee-scraped, lung-busting, burr-caked finest. I enlist pal Ron Perry to join me for the Howl at the Moon, which seems like the perfect addition to my self-proclaimed Year of Adventure. We sign up for the “sport” version of the race, mentally preparing for two to four hours of romping through one of my favorite Texas parks after dark. More experienced racers sign up for the “adventure” version, billed as a four- to six-hour event. Long races like this give you plenty of time to get to know your fellow competitors. We meet Gass and McKinley, who both live in Austin, before the blast of a horn signals the start of the race. While some teams erect tents and arrange nutrition bars, band-aids and spare headlamps on tables, they point at a pair of slightly neglected bikes on the grass at their feet. That’s it. That’s all they need. Or maybe it’s all they have. The women tell us they signed up for the race on a lark, about a week earlier. Gass and McKinley don’t look like the rugged, muscle-bound competitors you might expect at an event like this, but they’re ready to have fun. Gass hiked most of the Appalachian Trail a few years ago; McKinley joined her for a week. Both have run marathons. A short adventure race is hardly cause for worry — or excessive preparation. Except, maybe, for that pitch-dark part. 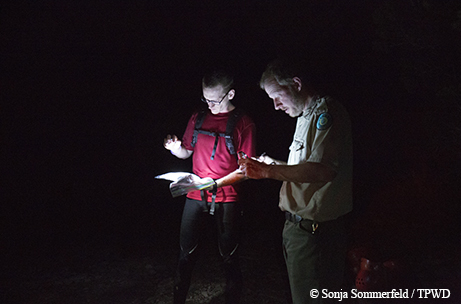 “It’s such a different perspective when the world is your headlamp,” Gass says. At the other end of the spectrum, we meet Ryan Holloway, 35, and Casey Campbell, 37, both of Houston, adventure racing veterans. They signed up for the longer version of the Howl at the Moon, and say they like the not-knowing-what-you’re-getting-into aspect of the sport. The secret to success, they tell us, is hydration, electrolytes and plenty of food while you’re on the course. Patience, too. Best tip? “Stay together, work together as a team — physically and mentally,” Campbell advises. We all stand at attention during the prerace briefing, as race organizers remind us to stay within 30 seconds of our partners and warn us to read our directions carefully. “If you find yourself hanging from a cliff, something is amiss,” race director Robyn Cantor warns, as vultures circle overhead. The race begins with a 1-mile round-trip dash to the base of moss-carpeted Gorman Falls, where we complete a quick Halloween-themed art project (weaving a paper owl!) before heading back to race headquarters to pick up our first list of checkpoints. Ron and I locate the points on a map and quickly figure the best way to link them up. In adventure races like this one, it doesn’t matter what order you hit the checkpoints, but that fateful decision can mean hours saved or lost during the race. We hop on our mountain bikes and crunch up a gravel road as the sun fades. Our adventure begins. In the next few hours, Ron’s headlamp fails, we miss a checkpoint and wind up riding down (and back up) a steep hill to find it. I belly-crawl through a cave. And I find myself tip-toeing along a narrow path above a 15-foot drop-off, clinging with one hand to a metal line attached to a rock ledge and to my bike with the other. I wonder if something is amiss, as the race director had earlier suggested, but it isn’t. We finally see the lights of race headquarters flickering just ahead. Or maybe it’s just lightning — a storm is brewing in the distance. A few sprinkles of rain later, we return to our home base, tossing back energy bars and preparing for the second leg of our race, the trail running segment. We plunge into the woods on foot. 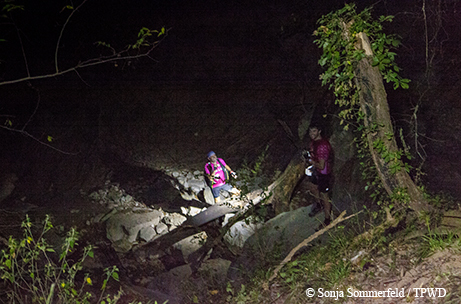 Here’s the thing about trail running at night. You have to focus intently. I pick my way up the hillside behind Ron, setting a pace so slow zombies surely could catch us. At that thought — and thoughts do wander when you’re running through rocky, cactus-studded terrain under the glow of a pearl-colored October moon — I speed up a little. That’s when I hear it, like a maraca, an instant before the beam of my headlamp catches a rope-like shape slithering across the trail. I hop around like someone’s taking potshots at my feet. Ron stops to get a closer look. Yep, a 3-foot rattler. But we have places to go, so we scamper on into the night. Our route takes us past a marshy pond, over car-sized boulders, down rocky inclines and finally back to race headquarters, where we have one leg of this adventure still left to conquer: the paddle. We look at our map and aim ourselves at the river, half a mile down the trail. There, we grab one of the kayaks stashed alongside the river, slide it down a sharp ridge and push it into the water. Have you ever paddled at night? It’s hard to see rocks hidden beneath the surface. I stand in the river in my sneakers, struggling to unwedge the boat from a rocky maze. When I finally free it, we slosh downstream until we glimpse a marker indicating the last checkpoint. We clamber down a draw and duck beneath a rocky overhang. There, we punch our passport one final time, head back to our kayak and paddle home. At some point in an adventure race — and for us it happened on the river — you have to just pause and soak it all in: the starry sky, the warm night air, the spicy scent of native plants hanging in the air. We drop our paddles into our laps, stare up at the moon and admire the reflection on the water. Ron and I agree that we just liked experiencing the outdoors in a whole new way, paying attention to the smells and the sparkles and the night prowlers. Plus, even though I’d visited this park a dozen times, I saw parts of it during the race that I’d never seen before. “Everything we did seemed sharper,” Ron reflects. We still have a race to finish, though, so we drag our boat to shore, run the last half-mile back up the hill to race headquarters, and high-five as the race director clangs the cowbell. It took us almost six hours, well over the estimated finish time (two to four hours), but our time lands us in second place. I’m actually glad it took us so long, too. That just gave us more time to enjoy the outdoors. After we finish, we sit at race headquarters, chatting with other racers as they trickle in. Davis tells me about another adventure race he and his wife once did in the desert. That one ended with him breaking down in the 118-degree heat, vomiting and getting extracted from the race. Big fun. But even those race hiccups serve up interesting life lessons. Something unexpected always happens, too, and for Davis’ team tonight, it happens on the river, when a 16-inch carp jumps into their boat. That’s the kind of fun adventure racers appreciate. 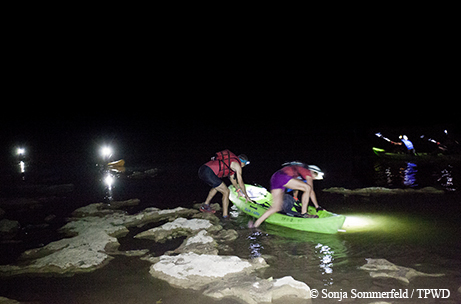 The race organizer, Austin-based Too Cool Adventure Racing, has staged gritty, no-frills races at parks and camps around Central Texas since 2005. While bigger, mass-produced events like the Tough Mudder and Spartan Race lure thousands of participants who run a marked course of manmade obstacles, Too Cool races draw between 50 and 200 hardy folks who’d rather run through the woods on their own or with a partner. They never follow a marked course, and competitors can’t bring a GPS device to navigate. Map-reading skills are critical. 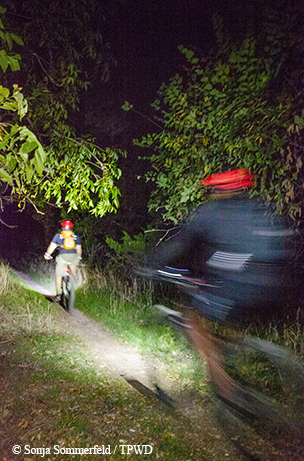 The company stages half a dozen or so races a year, including this nighttime version. Most include short and long options. In all, we biked 10 or 12 miles, ran 5 or 6 and paddled about 2 miles during the “sport” version of Howl at the Moon. Sometime after 1 a.m., the awards ceremony takes place. Gass and McKinley finish fourth in the sport category. They collect their award — not a glistening medal or a gold-plated cup, not even a trophy. For this sweet victory, the top finishers collect nothing but small metal cups filled with candy. Experiencing a park, under cloak of darkness, in a whole new way.